This graphic provided by CenturyLink shows the neighborhoods where Prism TV service is now available. CenturyLink announced its Prism TV service is available beginning Tuesday to 100,000 customers in Seattle. Comcast’s tight hold over TV services in Seattle is loosening, at least for some city residents. 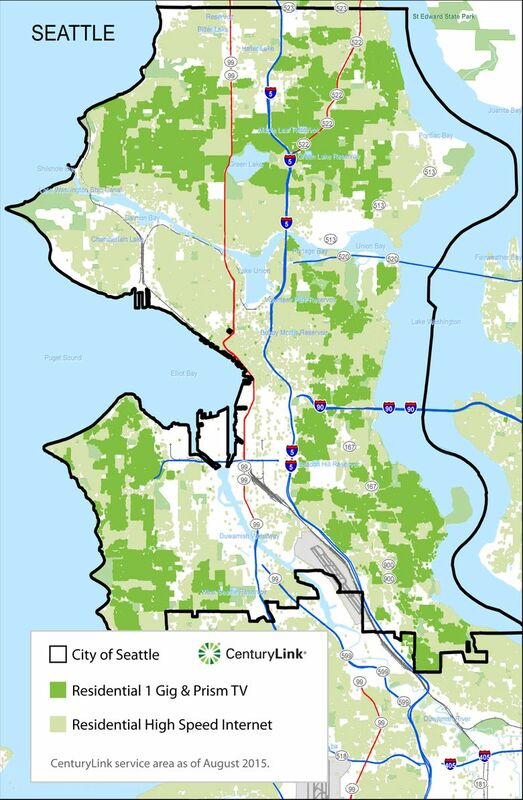 CenturyLink announced Tuesday that its Prism TV service, delivered over its high-speed fiber broadband network, is available in more than 22 Seattle neighborhoods where the company has rolled out its gigabit broadband service. Prism TV runs through the existing network of fiber-optic cables and is delivered much as the Internet is. CenturyLink began building out an extensive fiber network and providing high-speed broadband service to the city last year. It is now in nearly two dozen neighborhoods, and the company is continuing to expand. Does not include modem and equipment rental fees. • Prism Essential: $34.99 for 140+ channels (must have Internet or phone subscription). • Prism Complete: $39.99 for 190+ channels (must have Internet or phone subscription). • Prism Preferred: $49.99 for 290+ channels. (must have Internet or phone subscription). • Prism Premium: $79.99 for 320+ channels (must have Internet or phone subscription). Prism, now entering its 16th U.S. city, has been highly anticipated by Seattle techies, especially when CenturyLink began testing it in a few high-rises this spring. It offers a huge list of channels, as well as interactive games and videos on demand. The company said the service has “warp-speed” channel-changing abilities and a search function that lets you find shows by title, actor or other criteria. Customers need a portable wireless box to power Prism, and the box can be taken outside or into different rooms. CenturyLink also created a mobile app for Prism, reaching out to the growing number of people who are opting out of traditional TV services for streaming options. It’s not necessary to use CenturyLink Internet to subscribe to Prism TV, but customers must live in one of the neighborhoods that CenturyLink’s gigabit-service reaches and subscribe to at least one CenturyLinks product. Prism starts at $29.99 per month for some Internet subscribers. Prism’s entrance brings a major Seattle competitor to Comcast, which has long been the leading cable-TV provider in the region. Comcast’s reign came, in part, from a couple of City Council laws that were recently struck down and changed. Comcast has a franchise agreement with Seattle to provide cable service, and it expires early next year. Under Seattle’s long-standing cable-franchise district systems, cable providers must offer service to all neighborhoods in a large geographic area. The idea was to ensure access was available in low-income areas, but many believe it made the bar too high for smaller cable companies to enter the market. The City Council did away with districts earlier this year. Seattle’s technology department and the mayor have insisted for more than a year that they are taking steps to get more competition into the broadband market. Some Seattle residents have taken to Reddit to vent about the city’s broadband, which is largely dominated by Comcast. In recent months, competitors have started to expand. That includes Kirkland-based Wave Broadband, which raised $130 million in May to roll out high-speed Internet access and cable TV on the West Coast, including in Seattle. The city approved legislation late last year that made it easier for broadband companies to string fiber by striking down a rule that required a high threshold of neighbor approval to install utility boxes. Competition is increasing, and that’s better for residents, Seattle Chief Technology Officer Michael Mattmiller said Tuesday. “What we see is when there is competition in the market, it makes prices more competitive and it causes all providers to up their game,” he said. CenturyLink secured a 10-year cable-TV franchise agreement with the city last month, becoming the third to do so after Comcast and Wave Broadband. Part of the agreement requires CenturyLink to open a retail store in the city, which Anderson said the company plans to do in North Seattle by the end of the year.